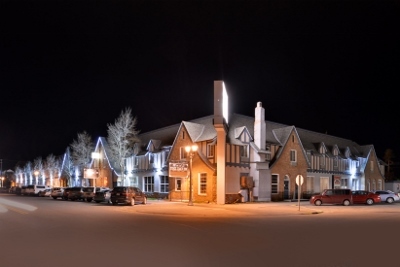 In West Yellowstone, Montana, perfectly situated at the west entrance to Yellowstone National Park, the Stage Coach Inn is a well known landmark hotel, and, it's completely modern and up to date. Celebrating our 70th anniversary, we have a beautiful new indoor pool, sauna, and exercise room in addition to our 83 guest rooms. It's an ideal location for Yellowstone explorers of every age in all four seasons. We kindly invite you to join the thousands of happy guests who've made wonderful everlasting memories at the very special Stage Coach Inn. Free deluxe continental breakfast is served just off the hotel's spacious main lobby, and we have free Wi-Fi access so you can easily stay in touch even from our edge of the wilderness. Our rooms have free internet, 32 inch flat screen cable TV, air conditioning, microfridges (deluxe rooms), hairdryers, and all amenities you'd expect from a first class hotel. 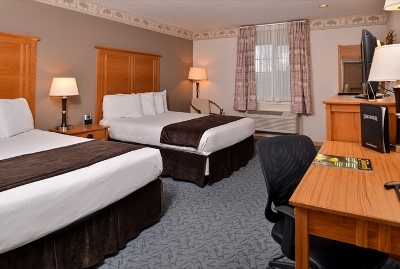 There's ample outdoor parking, and a free underground parking garage, heated in winter. We have an elevator, guest laundry, and are in easy walking distance to everything in town, including just a few blocks to the park entrance. Book from this website and save 10%, please enter your dates and click "check availability" at the top of the page to check for rates and book your stay. 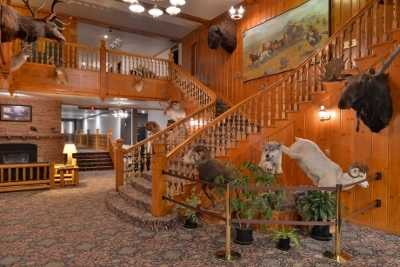 "Home to the Yellowstone Visitor," the Stage Coach Inn combines warm western ambiance with the amenities of today. 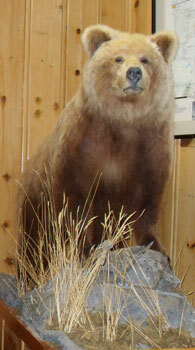 Our Wildlife Display, located in the hotel's main lobby, is unique to the Stage Coach Inn. Here you can see up close authentic realistic displays of many of the animals native to the Yellowstone area, including American Bison (Buffalo), Gray Wolf, Rocky Mountain Goat, White-Tail Deer, Mule Deer, Grizzly Bears, Black Bears, Elk, Fish, Mountain Sheep, and Moose! Yellowstone--the name conjures visions of natural wonders--geysers, rivers and abundant wildlife--a wilderness so awesome that no one believed mountain man Jim Bridger when he described what he saw here. Join us and Explore Yellowstone National Park.